Today at Kirkus, I write about Aaron Reynolds’ Creepy Carrots!, illustrated by Peter Brown, and Michelle Knudsen’s Big Mean Mike, illustrated by Scott Magoon. Or: Some cute, fluffy bunnies and some dastardly carrots. Here’s the link. Next week, as always, I’ll follow up with some art from each book. 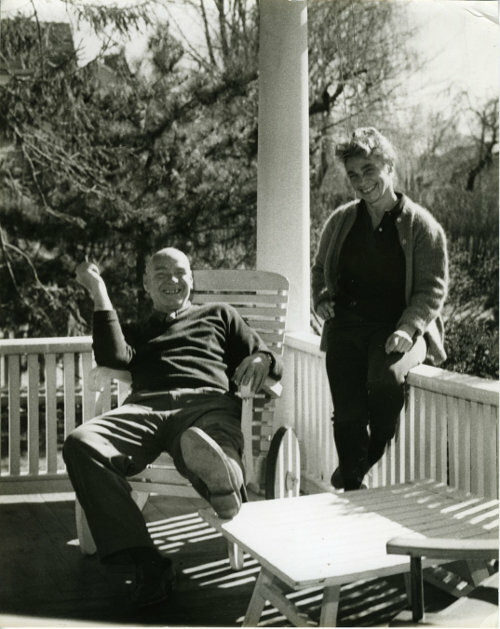 Ruth Krauss and Crockett Johnson on their front porch, 1959. Image courtesy of Smithsonian Institution. Reproduced courtesy of the New Haven Register. Last week at Kirkus, an abbreviated version of a Q&A I conducted with author, professor, and blogger Philip Nel was posted over at the Kirkus Book Blog Network. We discussed his latest book, a double biography, titled Crockett Johnson and Ruth Krauss: How an Unlikely Couple Found Love, Dodged the FBI, and Transformed Children’s Literature. This week here at 7-Imp, I’ve got the interview in its entirety, along with some images from the book. Many thanks to Phil for taking time from his busy schedule to chat with me about this fascinating book. Jules: Part of your book’s sub-title is “How an Unlikely Couple…Transformed Children’s Literature.” Given their influential work across multiple disciplines (children’s lit, comics, graphic design, fine arts), what do you think their most enduring contributions are to the field of children’s literature? 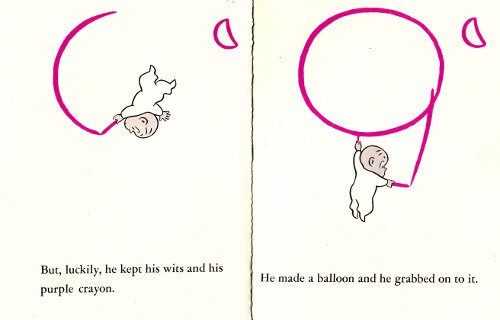 Philip: Crockett Johnson’s Harold and the Purple Crayon is the most succinct and profound distillation of imaginative possibility ever created. Understandably, it’s inspired many other children’s writers. Stewart I. Edelstein, Executor. All Rights Reserved. 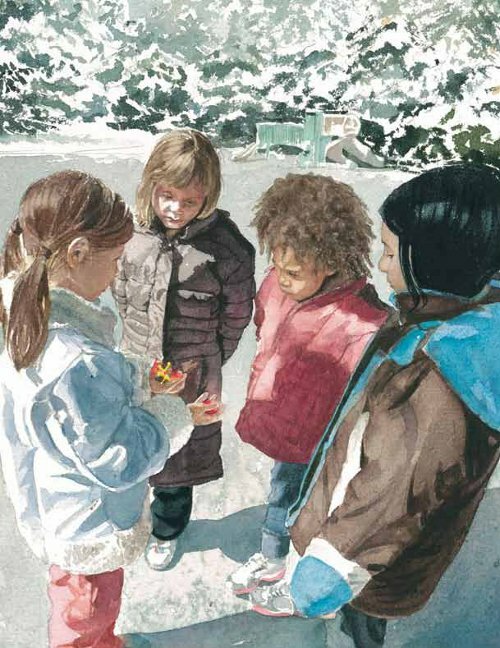 Robinson’s mixed media illustrations convey emotion with a child-like clarity and seeming simplicity; they are a striking accompaniment to Watson’s words. Today, Christian shares art from this book, as well as lots of other art, and I thank him for visiting. “One day, while we were near the slide, Maya came over to us. She held open her hand to show us the shiny jacks and tiny red ball she’d gotten for her birthday. It’s a high bouncer, she said. But none of us wanted to play. Just about everywhere you look these days, you see one campaign or another against bullying. Surely, many of these efforts do some good, though what bothers me is the occasional organization with inherently exclusive inclinations (you can belong to this group, as long as you’re not ____ or _____) mounting such campaigns. Personally, I think it all starts and ends with parents teaching their children that we should all treat each other the way we ourselves want to be treated, and that’s about all there is to it. At the same time, I know these things can be complicated. 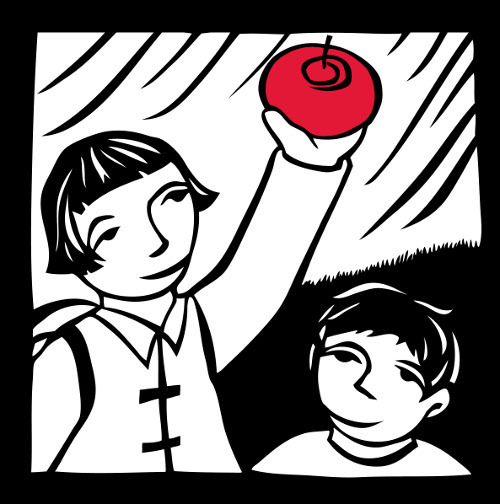 Nevertheless, what I always want to say in response to the fight-against-bully campaigns is that there are some great picture books in the world that tell straight-up good stories about kindness and empathy. And storytelling is the way we should go about this, yes? 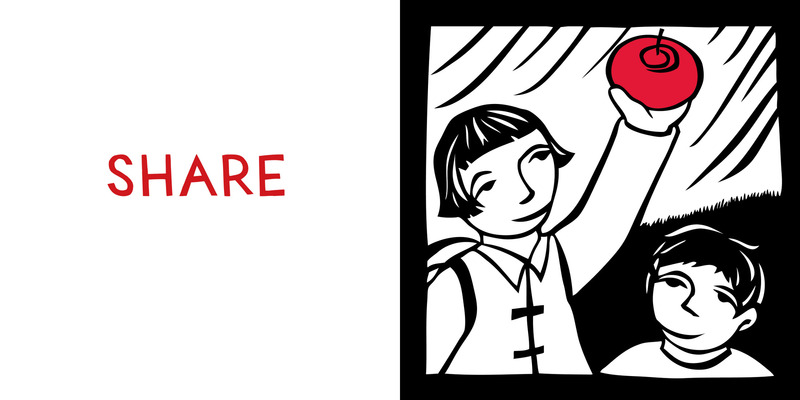 No child wants to be lectured, and who doesn’t want to hear an engaging story? Right? Right! 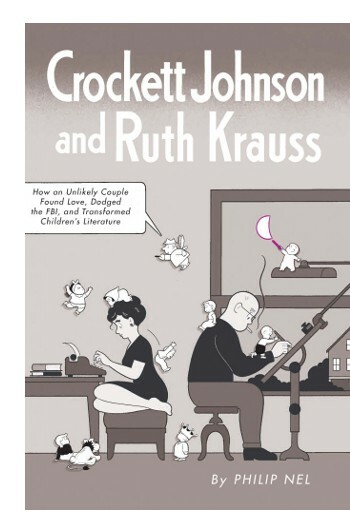 This morning over at Kirkus, I’ve got a Q&A with author, professor, and blogger Philip Nel, and I ask him about his latest book, Crockett Johnson and Ruth Krauss: How an Unlikely Couple Found Love, Dodged the FBI, and Transformed Children’s Literature. 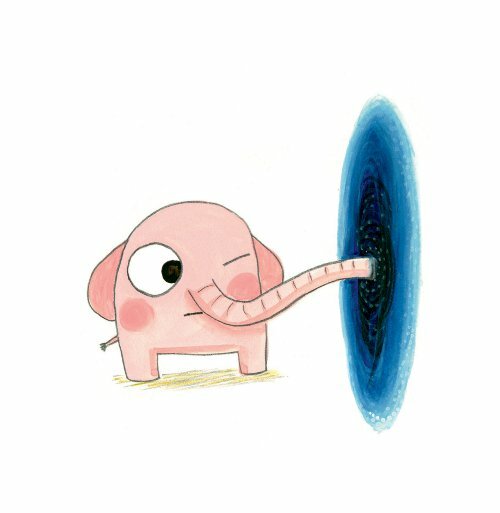 That link is here, and next week I’ll follow that up here at 7-Imp with some images from the book (as well as Philip’s interview in its entirety). 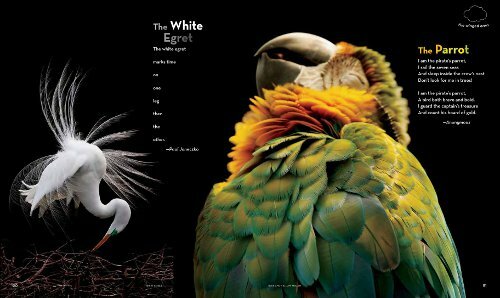 Last week, I wrote about the National Geographic Book of Animal Poetry, to be released in September and edited by Children’s Poet Laureate J. Patrick Lewis. That column is here. This is such a beautiful book. You don’t want to miss it. Today I’ve got several spreads from it. So, here they are. Enjoy. 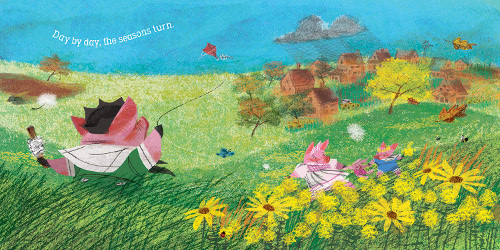 And I’m going to start with Ramona Bădescu’s Pomelo Explores Color (originally released last year in France as Pomelo et les couleurs), illustrated by Benjamin Chaud and coming from Enchanted Lion Books in October, because an image from this book opens the post today. Author/illustrator Susan Gal, who began her career in illustration by doing poster and calendar art, followed by work as an animator, is relatively new to creating picture books, and I’m glad she decided to do so. Since her picture book debut in 2009, I’ve followed her titles with interest. 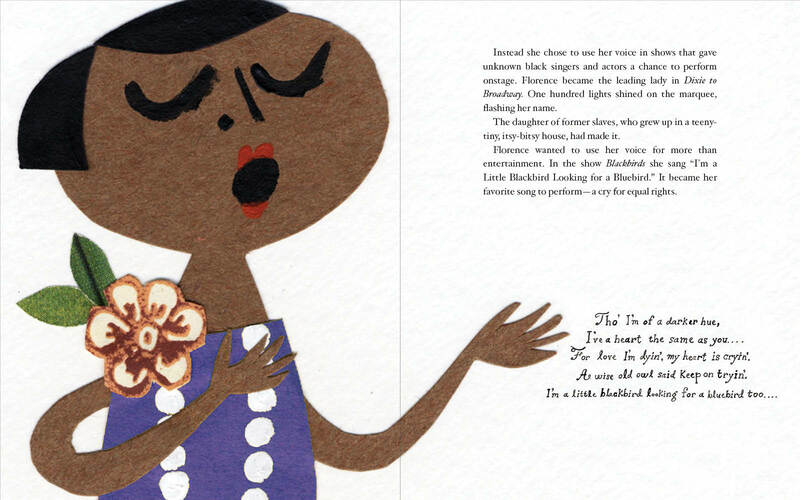 As I once wrote here at 7-Imp (and as the Kirkus review noted for her debut title), there is a warmth, not to mention an Ezra Jack Keats vibe, to her artwork. 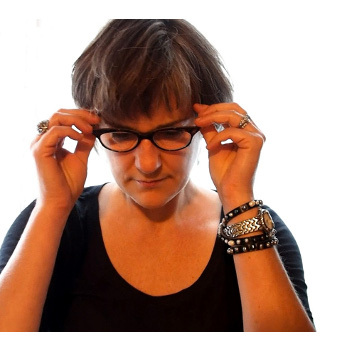 A Keats vibe, yes, but Susan still has a style all her own — as you’ll see in the artwork featured here in the interview today. 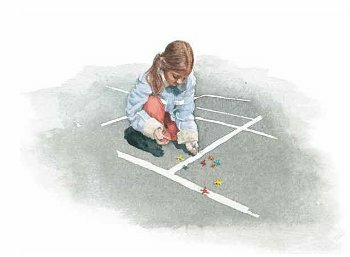 Susan’s newest picture book, Day by Day, released by Knopf in July, is a joyous celebration of family and community, which has been met with good reviews all-around. 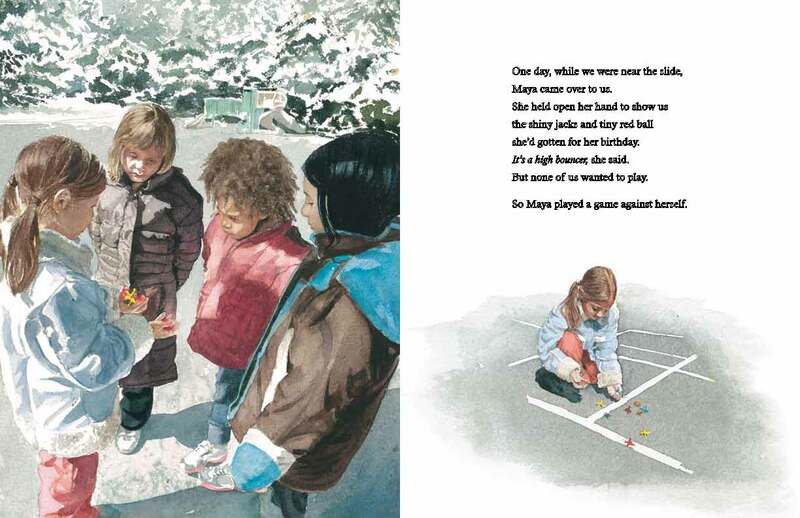 As you can see in the sketch and final spread below, her work can be textured and colorful, though in more than one of her picture books thus far, we see how expert she is at conveying night-time spreads with clarity, warmth, and beauty. Let’s just get right to the interview, since she shares so much artwork today, not to mention we’re having a “fresh-pressed mug of Noble’s Ethiopian ‘Worka’ blend coffee with steamed milk and steel-cut oatmeal with seasonal fresh fruit, topped with toasted almonds.” Mmm. I’m ready to eat and see lots of art. Remember how we got a bit dark and grim/Grimm a couple weeks ago? I’m gonna do that again today, because I just can’t pass up the opportunity to post some of the illustrations of Andrea Dezsö. And, to be clear right off the bat, this is an illustrated book, but it’s not a picture book for young children. This is very much a YA/adult title. This is the world of Ever After, and this ain’t no Disney. Today at Kirkus, I write about the National Geographic Book of Animal Poetry, edited by J. Patrick Lewis. That link is here this morning. 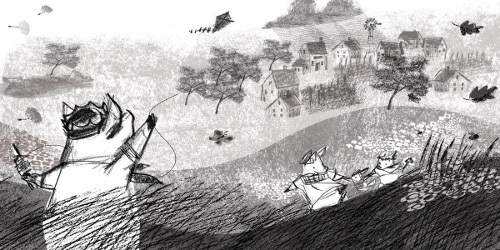 Last week at Kirkus, I talked about the Fall 2012 picture book titles I’ve seen in advance (and that I really like) and which will be released soon. (Here’s the link.) Today, I’ve got a lot of art to showcase, at least one spread from each of the books I mentioned in that column. A few quick notes: If you like what you see here from Christian Robinson, I’ll have an interview with him relatively soon, not to mention Stephen Savage. 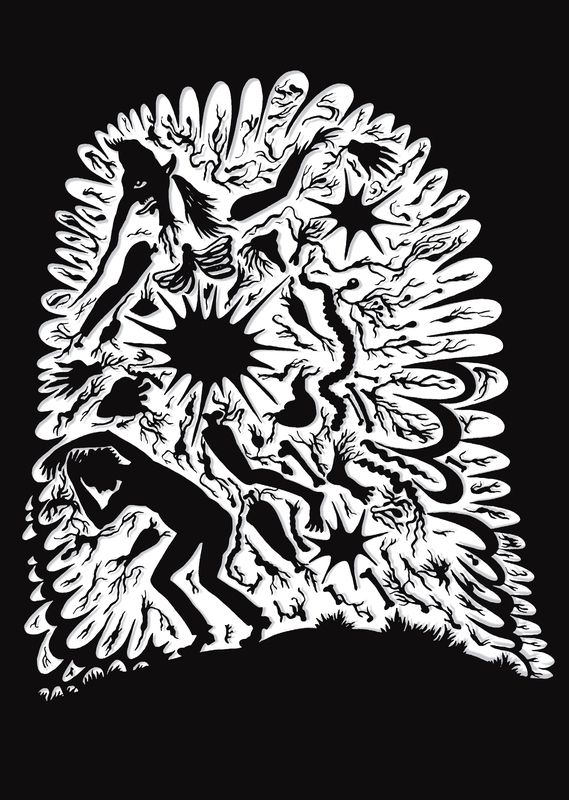 I’ll also be showcasing Matthew Cordell’s hello! hello! later, as well as Candace Fleming’s and Eric Rohmann’s Oh, No! And, if you want to see more from Philip and Erin Stead’s Bear Has a Story to Tell, I featured it here at 7-Imp last Sunday. Finally, I’ll also have a Q & A with Sarah Stewart and David Small within the next month, as well as a post that shows many of David’s early sketches for The Quiet Place. I think that’s it, though there could be more. There could always be more.